I’ve developed a bit of a thing for this baked pumpkin. It all started back in October. We’d planned a Halloween party and I had my heart set on baking something — maybe soup — inside a pumpkin, mostly because I thought it would look cool. But really. Who wants to stand around at a party eating soup? So I scrapped the baked pumpkin idea and then, when Chris got sick, the party itself. Which worked out rather nicely, because you know what’s great for sick people? Soup. I’d originally intended to fill the pumpkin with cream and gruyère, but my cheesemonger sent me home with three other fancy cheeses and this recipe in Gourmet persuaded me to add bread to the mix, making the resulting dish less a soup than a warm bowl of soft, gooey cheesy goodness. And when the weather forecasters can talk of nothing but lake effect snow and wind chill factors, and icicles the size of your arm hang menacingly from your rooftop, cheesy goodness might be the only way (short of a trip to Hawaii) to lift your spirits. Which helps to explain why I’ve now made this four times in as many weeks. Plus there’s garlic — deliciously mellow roasted garlic, lending its carmelized sweetness to the melted cheese and bubbling cream that soften the bread and flavor the pumpkin flesh. Seriously, yum. I think we can all agree that this bowl of mush isn’t about to win any beauty contests, but it’s certainly the tastiest, most comforting bowl of mush ever to grace our table. And if that weren’t enough, I have the added satisfaction of watching Mr. I-Hate-Vegetables gobble up pumpkin like it’s, well, frozen pizza. Which is almost heart-warming enough to make me forget about the ice and snow. 1) Preheat oven to 375 degrees. Peel some of the papery skin from the bulb of garlic, leaving only a thin layer. Trim the top off the garlic bulb to expose each clove. Place the bulb in a small roasting pan and drizzle the olive oil over the garlic. Roast for about an hour, or until the garlic can be easily pierced with a knife. Remove from oven and allow to cool. 3) Toast the baguette slices in one layer on a baking sheet in a 450 degree oven for about 8 minutes. The crisper they are, the more they’ll retain a bit of their texture as they bake in the pumpkin (which is a good thing). 5) Sprinkle ¼ t. salt inside the pumpkin and then place a layer of toasted bread on the bottom of the pumpkin, then cover with a layer of cheese and about 1/3 c. of the cream mixture. Continue layering bread, cheese, and cream until the pumpkin is full, leaving about ½” at the top. Cover the pumpkin, brush with olive oil, place in an oiled roasting pan, and bake in a 450 degree oven for about an hour and a half. 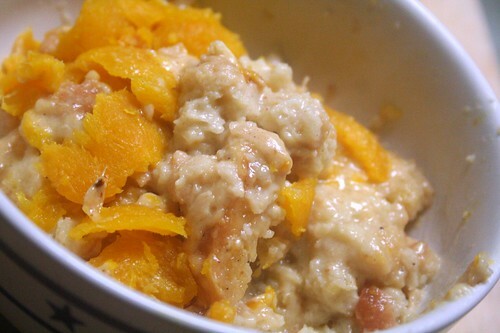 6) To serve, scrape the pumpkin flesh from the sides of the pumpkin and scoop the mixture into warmed bowls. This entry was posted on November 23, 2008 by Megan @ When Harry Met Salad. It was filed under eggs, dairy, & cheese, fruits & vegetables and was tagged with autumn, baked pumpkin, bread, cheese, comfort food, pumpkin, winter. Oh, lord that sounds wonderful. First of all, based on Chris’s inexplicable indifference to the potato gratin (Potatoes AND cheese! Together! ), I thought he wouldn’t eat this. Glad I was wrong. 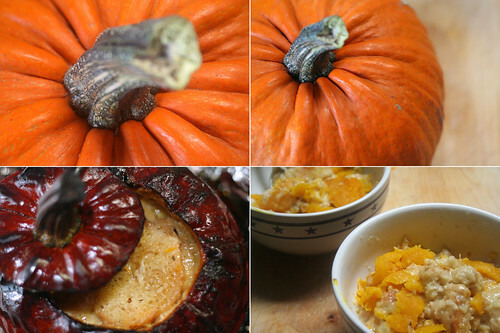 Secondly, since I don’t eat meat, I love to bake my T-giving stuffing inside a pumpkin to make it more festive. This recipe, however, will give me an excuse to stuff a pumpkin more than once a year. Yum. Holy crap. This looks fantastic. It inspired me to buy $30 of cheese, and now I just need to acquire a squash. I think I’ll try it with one of those dark green kabocha squash. I used squash and oly a bit of cheese. Turned out great! Oh my word! I’ve got to try this recipe. You’ve probably answered this question before, but here goes. Are you a professional chef, and do you work in the industry, or are you just an incredibly talented amateur who just loves food? Vikki – That’s a good stuffing idea. Do you scoop the pumpkin out with the stuffing? And Chris is just plain weird about potatoes. Clare & Lu – This recipe is neither frugal nor particularly low-calorie, but mmmmmmmmmmmmmmm. Kirby – What a compliment! I’d say I’m a reasonably competent amateur who really really really loves food. I’ve had absolutely no professional training and my industry experience has been strictly in the front of the house. And what I didn’t mention in this post is that the second time I made this pumpkin I tried to make it taste more like fondue by adding way too much wine and we ended up throwing it away after a couple bites. I probably screw up one thing for every five I get right. Yum! My friend makws something similar to this for Halloween. It’s so good. Yours looks super good as well. Actually, what I do is stuff medium little pumpkins, and then cut it into wedges at the table. If people want to eat the cooked pumpkin with their stuffing, they can cut if right off the rind like cantalope, if they want to leave it alone and only eat the stuffing, they can do that too. Do you put your photos on Tstespotting? Made this last year. Just used gruyere and white bread. It was beyond description. Exquisitely good! I will definitely have to try this recipe…like this weekend! You have some really delicious looking recipes here! Attractive element of content. I just stumbled upon your blog and in accession capital to say that I get in fact loved account your blog posts. Any way I will be subscribing on your augment and even I achievement you get entry to constantly quickly. Does http://whenharrymetsalad.com earn enough for you?